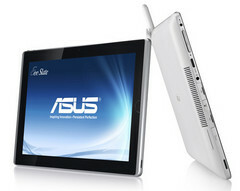 Taiwan-based computer manufacturer Asus will be aiming for the business sector in its latest Eee Slate tablet. Dubbed the Eee Slate B121, the tablet will be taking cues from the Eee Slate EP121 that was released back in February. According to ZDNet, the B121 is definitely in the works as Asus operation manager Bernard Wen reportedly mentioned the tablet during an e-mail interview about the Asus Eee Pad Transformer. Wen pointed out that the new tablet will sport an Intel Core i5 CPU with Windows 7 Professional, but additional spec info will have to wait until a later date. If the B121 will be anything like the EP121, however, we can expect the tablet to come with a Wacom active digitizer and an IPS display. No details have emerged regarding a release window for the B121, but our original review of the Eee Slate EP121 can be found here.